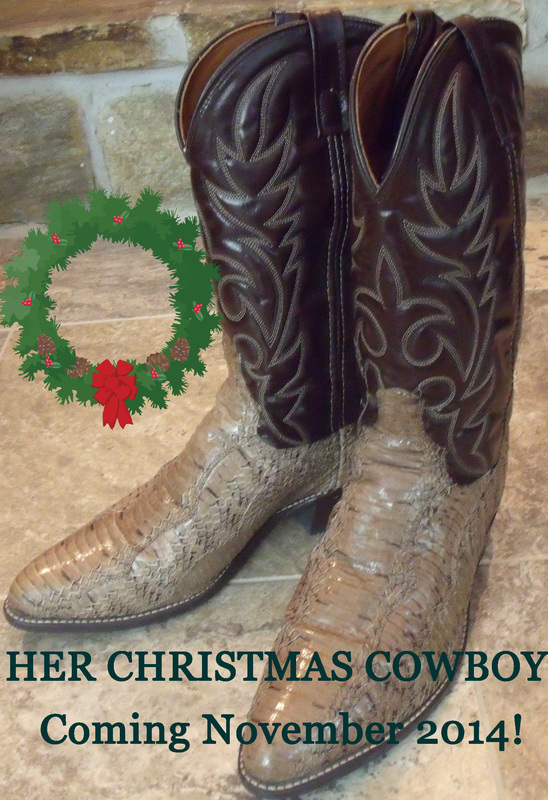 HER CHRISTMAS COWBOY, Coming This Christmas! I’m working on a Lunchbox Romance short story for Boroughs Publishing Group to be released November 2014, titled HER CHRISTMAS COWBOY. Readers have asked for more of Trey and Daisy from KISSING HER COWBOY and I’m excited to offer this standalone tale about their first Christmas together. More information coming this fall! Nothing says love to an author like a great review, especially for a new release. We authors work hard on our stories and hope our readers will enjoy them. When Examiner.com Women’s Fiction editor Kristin Contino included my new release KISSING HER COWBOY in her “Romantic Reads for Valentine’s Day” column and rated the story 5 Stars on Amazon, she gave me the best Valentine’s Day gift an author could hope for. Good reviews let an author know she’s done her job and point readers in the direction of a book they might enjoy. 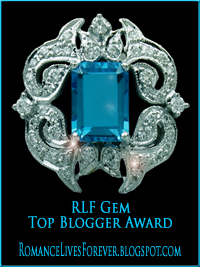 Do you write reviews for the books you read? Treymont Woods is forced to take light duty work around Breezy Meadows Ranch after a rodeo accident. While Trey’s body heals, he offers riding lessons to Houston locals on the greatest horse that ever lived, Big Blue. When police officer Daisy Phillips arrives for her first session, sparks fly. But her invisible wounds run deep, making it hard for her to form connections. KISSING HER COWBOY is the story of two broken people who heal on the road to their happily ever after. “Oh, Lord.” Treymont Woods kicked up dust on his boots as he sauntered from the stables to the woman who just had to be his new riding student. Her flaming red hair swooshed from one side of her shoulders to the other as she watched his stallion, Big Blue, canter inside the corral. Her hands, knuckles white, clutched the fence and every muscle in her tall, slim figure looked tight. Before he could get to her, she pivoted toward the parking area, moving her feet like she was fixin’ to run. “Hey there!” He called out as a distraction. By the time Trey reached the woman’s side, he could hear her breathing like she’d raced a Texas mile. Before he could introduce himself, she turned to him with wide green eyes and shouted, “He’s huge!” Pink splotches bloomed under the freckles on her pale skin. Trey lifted his hands in mock surrender. “Okay. No problem. You don’t have to ride if you don’t want to.” Her jeans looked too tight for riding, anyway, and that white blouse would be smudged inside five minutes. Hadn’t the woman ever been to a ranch before? 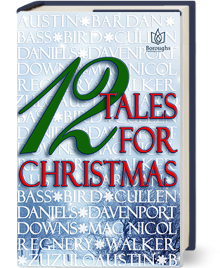 She stopped moving then and frowned at him, causing twin lines to form above her nose. Her adorable nose, now that he’d gotten a decent look. In fact, everything about the woman seemed downright appealing, despite her reaction to Big Blue. Who in their right mind wouldn’t love the greatest horse that ever lived, on sight? I’m thrilled to announce a new contract with Boroughs Publishing Group and their Lunchbox Romance line for KISSING HER COWBOY, a contemporary western short story. Release date is January 10, 2014. Story title still needs final approval, and I’ll be sure to report any changes. Cover art pending. 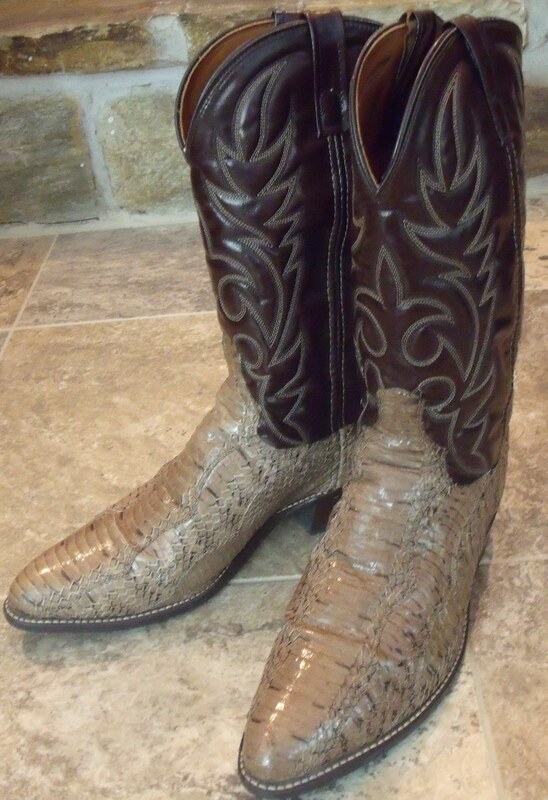 In the meantime, a pair of my husband’s cowboy boots will stand in as a visual!